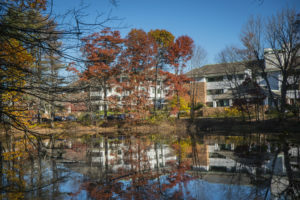 Orchard Cove is a life plan community located on 38 acres in Canton, MA, approximately 15 miles south of Boston. Orchard Cove provides a full continuing of care for residents including independent living, enhanced living and skilled nursing care. The campus includes 227 Independent Living Units offered in 20 apartment styles ranging from 1 bedroom to 2 bedroom/Den, 28 enhanced living and 45 Medicare-certified skilled nursing care beds. Hebrew SeniorLife (HSF) is the sole corporate member of Orchard Cove. Founded in 1903, HSF provides care to 3,000 seniors daily across nine Boston-area campuses and one of the largest not-for-profit employers in Massachusetts. HSF is affiliated with Harvard Medical Schools and is the only affiliate of the school focused on geriatrics. HJ Sims was privileged to have underwritten the bonds used to construct Orchard Cove in 1992 and has assisted with expansion financing and capital planning over the past several decades. We have worked closely with the HSL organization for over 25 years. HJ Sims was engaged by Orchard Cove to refinance its existing higher-rate tax-exempt, fixed rate bonds. Debt service on the prior debt was not consistent with high annual debt service payments through 2026, then significantly dropping thereafter through maturity in 2037. Financing objectives for Orchard Cove included level annual debt service as well as maximizing annual debt savings over the near term to fund further community improvements without increasing the debt load. In order to achieve the lowest interest rates possible on the new issue, HJ Sims worked with management to obtain a rating from Fitch, the first rating it had received from the rating agency. Historically strong operating performance, combined with a pro-forma Days Cash on Hand of 400 and a debt service coverage ratio of 6.72 (bolstered by strong entrance fee receipts) led Fitch to assign a BBB+ (Stable Outlook) rating. The maturity on the new bonds was extended and amortized over 30 years but included a 5-year call provision to maintain future flexibility. Maximum annual debt service was reduced by approximately $1.2 million, and aggregate debt service savings over the next seven years is $15.4 million. The new $19.95 million bond issue closed on February 22, 2019. With Sims’ leadership in collaboration with HSL management, Orchard Cove successfully realized its goals of reduced debt service while providing for additional funds for community improvements. For more information on how Orchard Cove was Financed Right® by HJ Sims, please contact Andrew Nesi at (203) 418-4057 | anesi@nullhjsims.com or Christie Rappl at (952) 683-7507 | crappl@nullhjsims.com.